WE’VE ALL HEARD that a podcasting boom is underway. Since January 2013, the number of podcasts listed on iTunes US has doubled (see Activity below). Part of the allure for content producers is that podcasting is a wild frontier in the new media landscape, waiting to be shaped and settled. 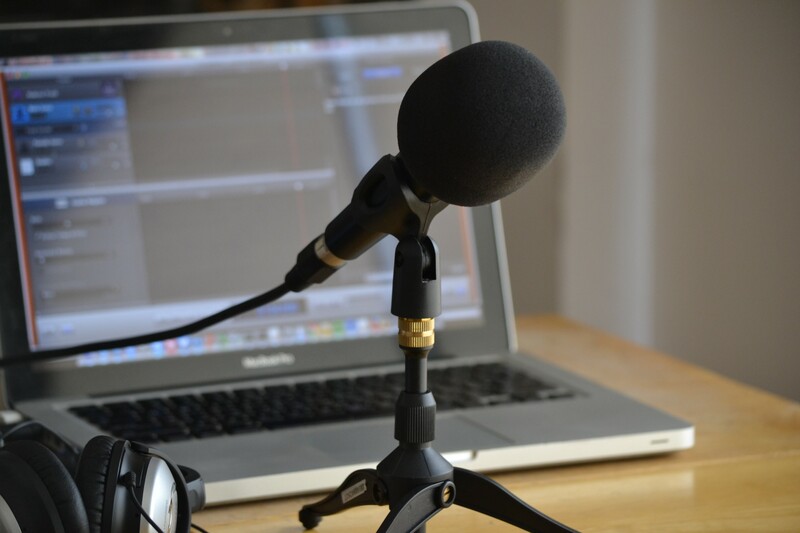 Some have questioned if podcasting is the new blogging, referring to a similar boom during the early and mid-2000's, but that remains to be seen. I’ve noticed since starting a podcast of my own that research on the field is scant. Most of the research I’ve read has focused on listener behavior, which is fine for marketers, but other questions about the medium have gone unanswered. I decided to address a few. What iTunes categories have the most podcasts? How many podcasts are launched per month? How many podcasts are active? How long is a typical podcast episode? How often is a typical podcast updated? How many podcasts have explicit content? How many podcasts are not in English? How many ratings or reviews does a typical podcast receive? I was also curious if these varied by category, e.g. “Are episodes in some categories longer than others?” or “Which categories have more explicit content?” Here was my approach. Podcasting is a young and decentralized medium. Thus far, Apple has been its most influential actor, having celebrated ten years of podcasts on its iTunes service in June 2015. During that span, Apple established many of the frontier’s early boundaries, like branding the medium with its generic trademark: iPod and –casting. Despite its dominance, iTunes does not house all of the world’s podcasts. Some podcasters avoid iTunes or do not configure their shows for it. Apple also separates its iTunes Store by country, so many international podcasts are absent from the US Store. Still, iTunes US was the best place to begin a sketch of the medium because its podcast directory was the largest at the time. Because Apple has not published a dataset on iTunes, I had to construct my own. I started by copying the names of all podcasts on the iTunes US directory as of June 2015. I divided them by iTunes’ categories and counted the names in each category. From there, I randomly selected a sample of 100 each from the twenty-five categories with the most names, which I combined for a total sample of 2,500. 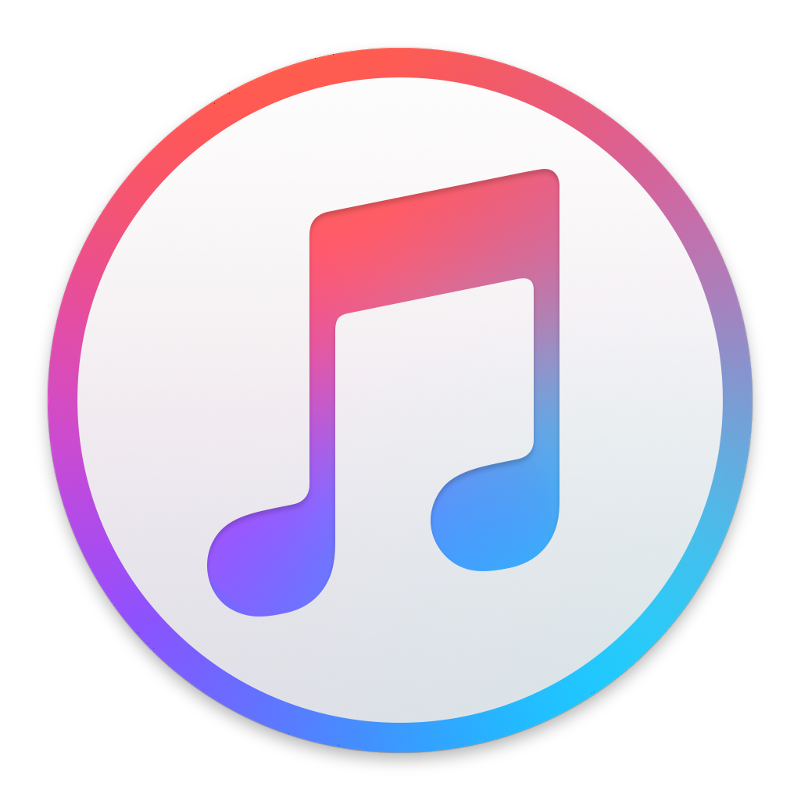 I gathered details on all 2,500 podcasts in the sample by searching for them in iTunes 12. I scanned the profiles of each for values of interest between June 2005 and June 2015: activity status; start date (and end date, if applicable); months active; items per month; Explicit status; English or non-English descriptors; median episode times; and number of ratings. Many of these were calculated using spreadsheet formulas. Here’s what I came up with. The data are available for categories, for cumulative podcasts, activity, and launches, and for language, explicitness, and minutes per episode. Charts were assembled in Excel and Photoshop. CATEGORIES: What iTunes categories have the most podcasts? The top three categories by quantity: Christianity, Music, and Comedy. 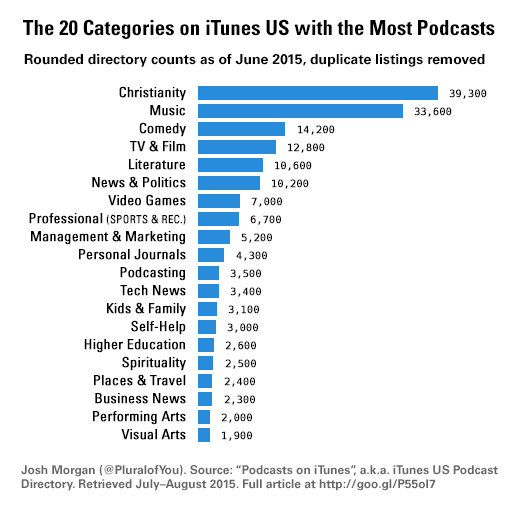 In June 2015, the directory for iTunes US listed over 271,000 podcasts. There was a catch: roughly a quarter of these were listed under multiple categories. For example, the most abused category was Podcasting, where about 11,500 of the 15,000 listings did not list Podcasting as the primary category — they were duplicated from other categories. After adjusting for duplicates, I calculated that the true number of podcasts on iTunes US as of June 2015 was around 206,000. I also measured the twenty categories on iTunes US with the most podcasts. The categories with the fewest podcasts were: Aviation (150); Hinduism (260); and Regional, a subcategory of Governments & Organizations (320). ACTIVITY: How many podcasts are active? About 40 percent. Over 60,000 per month were active as of 2015. Most podcasts are short-lived. Many go dormant after their hosts complete goals or lose interest. Others are part of larger collections, like audiobooks based on classical texts, and are left alone once they are listed. Between June 2005 and June 2015, a typical podcast ran for six months and twelve episodes, at two episodes per month, before going inactive. 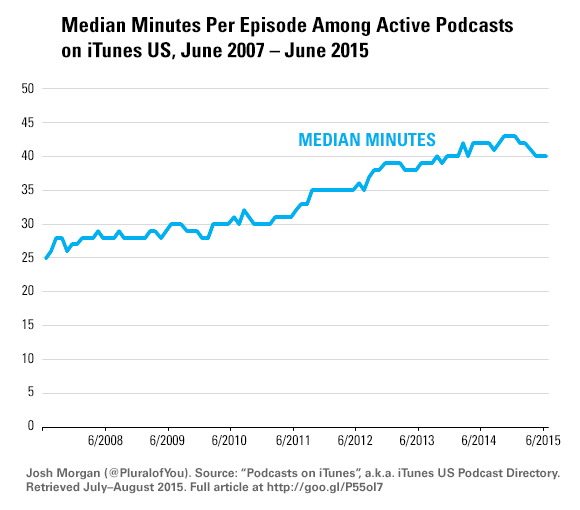 For this research, active podcasts were measured as those with at least one new item between January and June of 2015. I estimated the number of podcasts fitting this criterion on iTunes US at about 40 percent of the total, or roughly 84,000 of the 206,000 podcasts. The chart below shows that, as of June 2015, about 60,000 podcasts were active per month. The least active categories by percentage were Podcasting (23% active), K-12 (25% active), Literature, and Visual Arts (tied at 29% active). 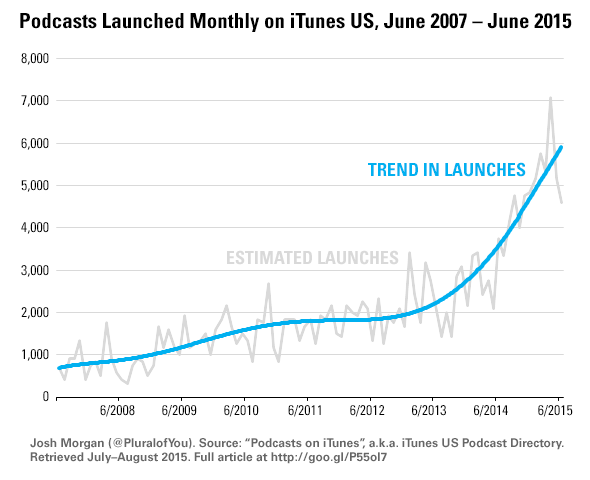 LAUNCHES: How many podcasts are launched per month? In 2015, podcasters added about 5,000 new podcasts to iTunes US per month. TIME & RELEASE RATE: How long is a typical podcast episode? How often is a typical podcast updated? As of 2015, a typical podcast published two 40-minutes episodes per month. The median number of minutes in a typical podcast episode has increased, from 25 minutes in June 2007 to 40 minutes in June 2015. See below. The categories with the shortest median times per episode were K-12 (10 minutes), Podcasting, and Business News (tied at 15 minutes). A preliminary analysis suggested that the median release rate increased from less than two episodes per month in 2007 to the semi-monthly rate, and it may still be increasing. EXPLICITNESS: How many podcasts have explicit content? 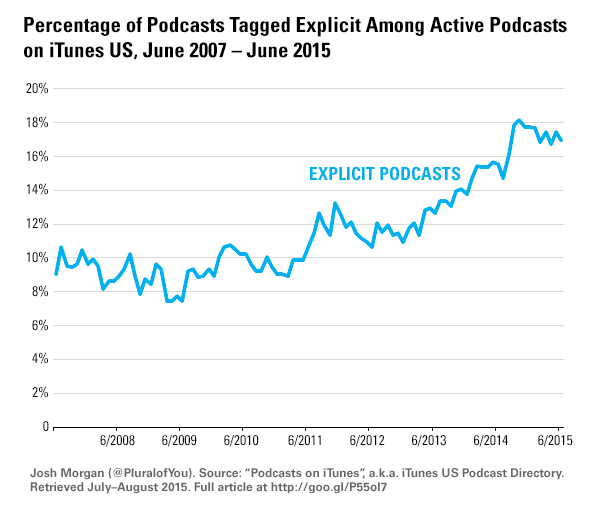 As of 2015, about four in 25 podcasts were tagged Explicit at least half of the time. When listing their podcasts on iTunes, podcasters can tag their episodes as either Clean or Explicit. Assuming the podcasts in the sample were tagged correctly, the percentage with over half of their episodes tagged Explicit almost doubled, from 8.4 percent in June 2007 to 16.6 percent in June 2015. Five out of the 25 categories had no explicit podcasts in their samples: Business News, Christianity, K-12, Kids & Family, and Self-Help. That’s not to say explicit podcasts don’t exist in these categories, but they appear to represent less than one percent of the podcasts in each. LANGUAGE: How many podcasts are not in English? As of 2015, roughly one in five podcasts on iTunes US were not in English. The United States is becoming more racially and ethnically diverse. So are the podcasts on iTunes US, at least linguistically. 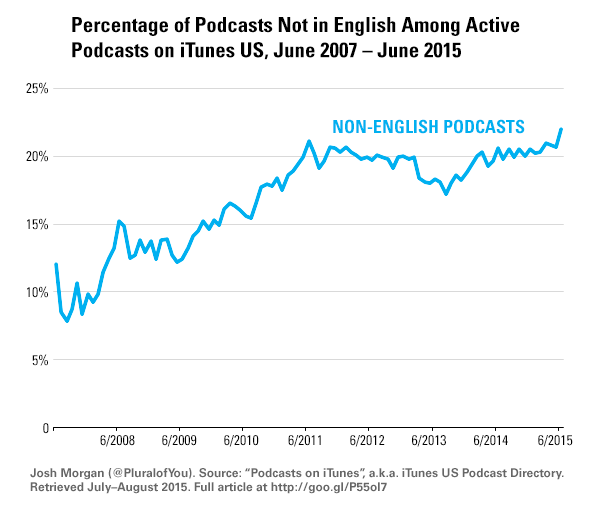 Non-English podcasts gained about ten percent on English podcasts between 2007 and 2015; by June 2015, non-English podcasts comprised 22 percent of the sample. The categories with the fewest non-English podcasts by percentage were Performing Arts (9% non-English), Comedy, and Self-Help (tied at 11% non-English). USER RATINGS: How many ratings does a typical podcast receive? Most receive none. Among those that do, seven was par for the course. On iTunes US, users can sign in with their Apple accounts and leave ratings for podcasts. They also have the option to leave written reviews. The median for ratings was a goose egg, as only 24 percent of podcasts in the sample had at least one rating. Among those, the median was seven. 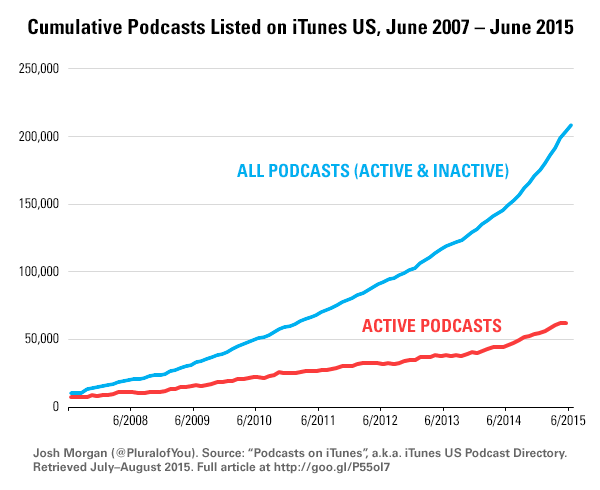 Assuming podcast activity and launch rates are indicators, podcasting is more popular than ever in 2015. However, most podcasts do not last more than six months before shutting down. In the context of time, podcasts appear to be getting longer and slightly more frequent. That’s a rich topic for discussion, especially with Video Games and Philosophy edging out other categories for episode length. Assuming language and explicitness are indicators, podcasts are becoming more culturally diverse. Non-English podcasts may soon make up a quarter of all podcasts on iTunes US. Podcasters have also gotten more colorful with their content, as their Explicit tags would suggest. This research isn’t a perfect representation of podcasting for three reasons. First, the data are based on a presumably major but unknown portion of the world’s podcasts. Second, statistical models are sketches of reality, not full renderings. The margins of error in many of the models here are shaky and would benefit from a larger sample. Third, this research shoehorns complex events into general patterns. There are exceptions that it does not account for, like podcasts that are revived after a long hiatus. Future research should address some of these problems. I hope this article will better inform the podcasting community: hosts, listeners, and entrepreneurs alike. It’s exciting to stand on a hill of this new terrain, and it will be interesting to see how we shape it all from here. Josh Morgan is an applied sociologist, podcaster, and friend of yours. This article is distributed for free on the honor system. Please credit Josh Morgan and link to this article when quoting its contents. 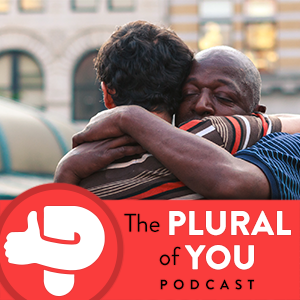 In return, please visit Josh’s podcast about people helping people, The Plural of You. You can follow it on Facebook or Twitter and subscribe for free. Thank you! If you would like to share this article with others, please ♥ Recommend it.